Monster Absolutely Zero is a zero calorie energy drink from Monster Energy. It contains a slightly different energy blend than the standard Monster, which gives it slightly less caffeine. 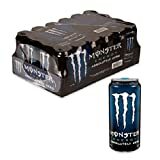 Absolutely Zero is promoted by Monster as a better flavor and a better tasting artificial sweetener blend than their original sugar-free drink, Monster Lo Carb. See our complete review for more details concerning Monster Absolutely Zero here. INGREDIENTS: CARBONATED WATER, CITRIC ACID, ERYTHRITOL, NATURAL FLAVORS, TAURINE, SODIUM CITRATE, PANAX GINSENG ROOT EXTRACT, COLOR ADDED, L-CARNITINE - L-TARTRATE, CAFFEINE, SORBIC ACID, SUCRALOSE, BENZOIC ACID, NIACINAMIDE, ACESULFAME POTASSIUM, SODIUM CHLORIDE, GLUCURONOLACTONE, INOSITOL, GUARANA SEED EXTRACT, PYRIDOXINE HYDROCHLORIDE, RIBOFLAVIN, MALTODEXTRIN, CYANOCOBALAMIN. How Does Monster Absolutely Zero Compare? Monster Absolutely Zero contains 8.75 mgs of caffeine per fluid ounce (29.59mg/100 ml). Email from Monster Energy and the can.